Thick cream, butter, and chocolate whipped into a fluffy mousse, covered in creamy milk chocolate. 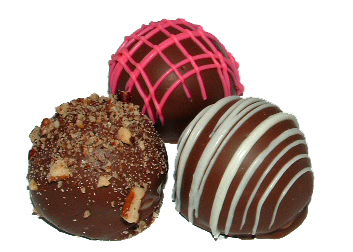 Available in three flavors, including Chocolate Raspberry, Chocolate with Drizzle, or Chocolate with crushed pecans. Presented in our signature gold truffle box. *When planning for holiday gift giving, please note that our Marie's Truffles have a short shelf life and are made and shipped to arrive just in time for the holiday. Item available for shipping or ordering online and picking up in-store.